The Washington Nationals may be middling around .500 when it comes to wins and losses, but the team is near the top of another list. 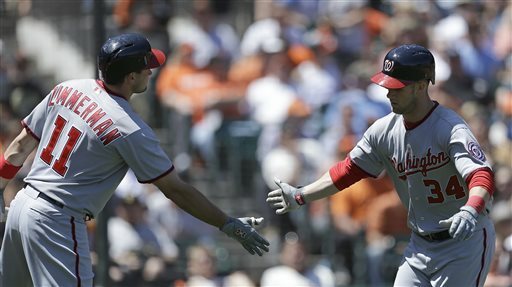 WASHINGTON – The Washington Nationals may be middling around .500 when it comes to wins and losses, but the team is near the top of another list. MarketWatch reports the Nats come in third among teams that give fans the most “bang for your buck.” A study by ticket reseller TicketCity ranked the 30 big-league clubs using a formula that takes into account these factors when teams play at home: median price for tickets on the resale market, the team’s winning percentage and how good each team’s opponents are. So while the Nats are struggling, their $21 ticket resale price is one reason they’re behind only the Pittsburgh Pirates and Detroit Tigers in the survey. The Boston Red Sox, meanwhile, have a $38 median ticket resale price and rank No. 26, despite having a .587 winning percentage as of June 1. The fairly awful New York Mets rank next-to-last on the list — right ahead of the Houston Astros — with a $38 ticket price and .406 winning percentage. In short, who wants to pay that much to watch a losing team? MarketWatch notes that since resale prices were studied instead of official ticket prices, a team that keeps winning could see its ticket prices go higher and the equation could change. Teams also can offer savings on official, box-office tickets, which weren’t part of the rankings. See the Top 10 “bang for your buck” teams in the gallery, and view the full list here. This story has been modified to clarify that TicketCity used baseball data as of June 1 for its team rankings.